Sixty-five degrees and sunny. / The lightest of breezes. / The sun, two hours from setting, in a cloud-streaked sky. / Elliott and I on the evening porch and a bird is singing, one, maybe two, a robin, and the peepers are peeping soft, in the background, and a sandhill crane is out there, somewhere, trilling. Elliott! In or out? Aw, what does it matter? Earlier, walking dogs up at the shelter. They seem all alike in their desire to go, to walk, to move, to run. All day on a mild day I look forward to these walks with dogs in the woods on soft, well-worn trails; each time now less snow, snow vanishing, but still, down a slope, along a river, a trail covered with six inches of soft, crummy snow. But who cares. 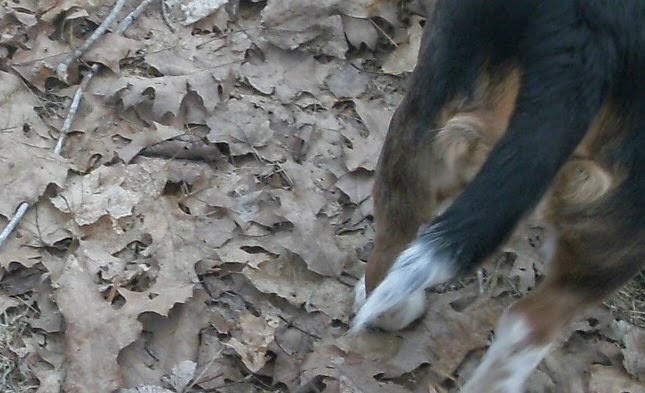 A beagle drags me to and fro. The dogs are all different. Some are easy to walk, not pulling so much as leading, and others are nearly impossible to walk—they pull, and they are stronger than I am. Alfie* (I mentioned her last week) leads. She puts her nose to the ground and shows me where she wants to go. She does not look up, neither left nor right, just straight ahead, goes. What if one day she put her nose to the ground and was suddenly gone across 18 acres and beyond? This is what I think the first time I walk her, after I have already seen her and taken the tumble. And the first time I walk her I realize that if you put the first two dogs in my life together the result would be, maybe, Alfie. The next time I walk her I realize I have never had a dog from whom I knew what to expect, meaning at the start there were never any expectations of who this dog would be, who it would become, how it would act or behave. Once I looked into adopting a racing greyhound, retired. The more I learned of what to expect, and the more I was told this is how it will be, the less interested I became. The first dog in my life was Joey. I don’t know where he came from, or how he came to be part of our family, he was just always there from my first memory. 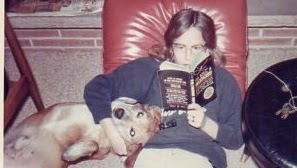 He was a basic brown, beagle-collie mix, a happy-go-lucky troublemaker who bit mailmen and assorted others. He also devoured hidden birthday cakes and out-in-the-open peanut-butter-and-jelly sandwiches. But he and I, well, he and I got along fine. 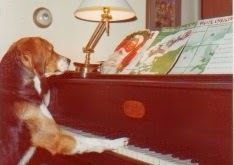 Niki came along because of the beagle in her—my dad liked beagles. But not enough, I guess, or in such a way, to purchase one purely bred. 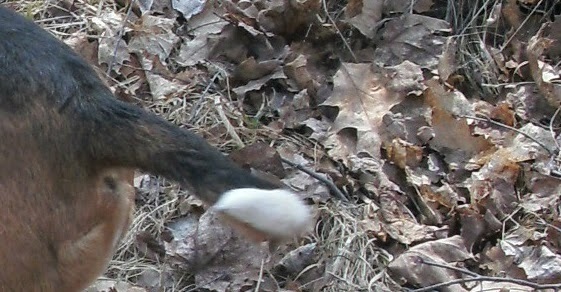 Niki was the result of some accidental breeding that occurred in a nearby suburb. She was fun, photogenic, and a nervous wreck. During a thunderstorm, she could take out a wall. In quieter moments, she played piano. In my twenties, I adopted Dandy after walking through a large shelter, picking him out because of the way he sat quietly and looked at me. I had to teach him not to be afraid of a throwing motion, and I had to teach him how to swim. He then loved chasing tennis balls at the beach. He was black with salt-and-pepper toes, and he was swift, smart, soulful. A lab-spaniel mix, I think. Buster was found, picked up out of a gutter. He was a terrier mix. Enough said. But of course you can read more, if you like. Queenie was picked out of a shelter by the man who was then my husband. I believe he chose her because she looked like Dandy, who had died just a year before. She was sweet, incredibly smart, a little sneaky. 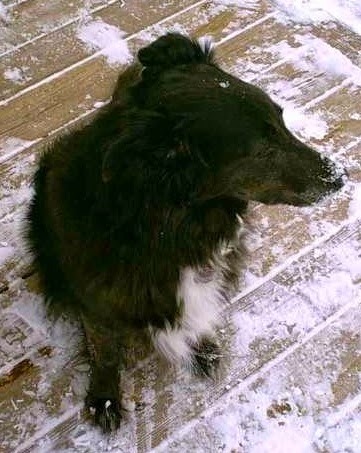 She was a border collie mix. So then, why not Alfie? I am ready, but is my life? As I think it over, I think maybe I am over-thinking. Saturday the farmers market opens for the season, so I’m busy making candles, and I’ve decided on the CD to crank up on the drive in: “The Best of John Denver Live.” Louis gave it to me in February so that while crossing the Rocky Mountains I could listen to “Rocky Mountain High.” I wish he, and you, and some dog, could be there with me. You know, I never liked this “Sunshine” song until I heard this version, which sounds just like the one on the CD. The difference is the age in the voice and the horn. Now it seems a sweet love song, a lullaby even. Good night, little doggies. * Alfie is not her real name. Though it could be, I suppose. You are right about there being so many out there -- and so many good ones! Travel plans are easier without a dog, and I have more travel coming up this summer. That's one practical reason for waiting. One thing I've been reminded of while walking the dogs at the shelter is the incredible emotional attachment I had with Buster and the other dogs in my life. The thought of starting that up again, oi. It is both the pull and the hesitation.